Time Flies is no longer for sale as I am unable to keep up development due to other commitments. I’ve left this site here for my own archival purposes. 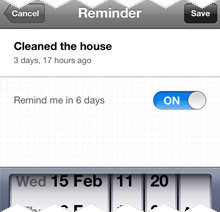 When did you last clean the house? Wash the dog? Call your parents? Buy flowers for your girlfriend? Time Flies is designed with simplicity and purpose: use it to keep track of how long it has been since you did something. When you’ve done something you need to remember, add a new event quickly and easily. New events are automatically set to the current time and date, or set the date to whenever you like - any time in the past, present or even future. Just did the same thing again? Update your event to “now” with a single tap. In Time Flies, the events you enter are displayed chronologically, so the things you do most often are the easiest to update. Like to track lots and lots of things? Bookmark your most important events to find them fast, or simply search your events to find that elusive item. If your memory is particularly bad, Time Flies can remind you. 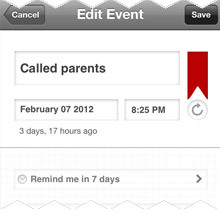 Be reminded via an app notification, or just let the event turn red in the list. Don't worry, Time Flies won’t pester you if you don’t ask it to. When you update an event, Time Flies keeps an event history. Use it to see how often you do something, how many times you’ve done something, to help you track goals, or just for general interest. Time Flies can export a CSV file and email it to you. things that you just don’t do often enough. Can I set future events? You sure can. Time Flies will count down to future events - just set a date in the future, then sit back, relax, and watch the time fly! How do I update an event to “now”? 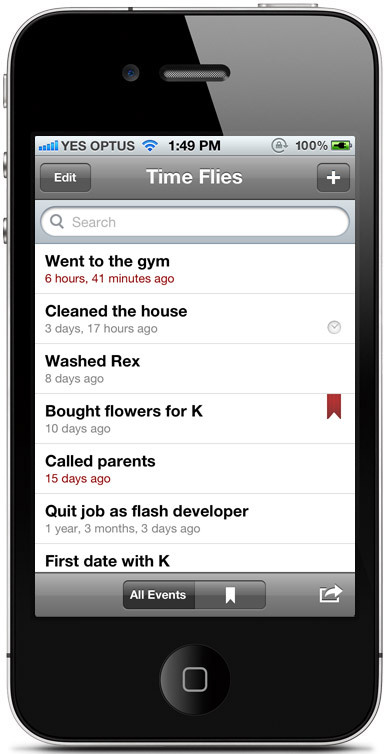 Select an event to edit and tap on the refresh button (underneath the bookmark on the right). How do I set repeating events? You can’t. I designed Time Flies specifically so that you have to update events manually - this way you can make sure that you actually do the thing you say you did. If events could automatically update, it would stop being a memory aid and be more like a calendar. Why doesn’t Time Flies show seconds? Why can’t I see minutes on some of my events? 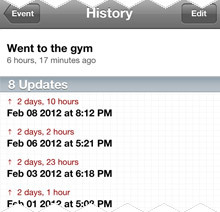 Time Flies is primarily designed as a memory aid, not a timer or a stopwatch. The list of events is prioritised to recent events in terms of accuracy - it will show minutes and hours for the first 24 hours; days and hours for the first 7 days; days, months and years after that. I figure this is accurate enough for most things you need to remember. Where is the iCloud version you promised? Unfortunately, I haven’t been able to get iCloud working reliably and don’t want to release the iCloud enabled version until everything is perfect. If you are an Apple developer, you can help out by duplicating this bug report. Will you be releasing Android/Blackberry versions? I only do iOS development, so I have no plans for Android and Blackberry versions just yet. Maybe in the future though, who knows? Why isn’t Time Flies free? I’m just one independent developer and I put a lot of work in to Time Flies. I have set the price as low as possible - If you find Time Flies useful, think of it as a small donation. I love/hate/have an idea for your app! Thanks! I love all feedback (good or bad). Email me with feedback, questions, and ideas to improve the app here: reuben@absentdesign.com, or send me a message on twitter @absent.